Amateurs John Ross Galbraith and Colm Campbell will compete at next week's Northern Ireland Open after being nominated by the Golfing Union of Ireland's Ulster Branch. The Galgorm Castle event will start a busy fortnight for the duo as they then head to Portrush to represent Ireland in the Amateur Home Internationals. "I know if I play well I can do really well," said Galbraith. Whitehead man Galbraith won the North of Ireland Championship two weeks ago. 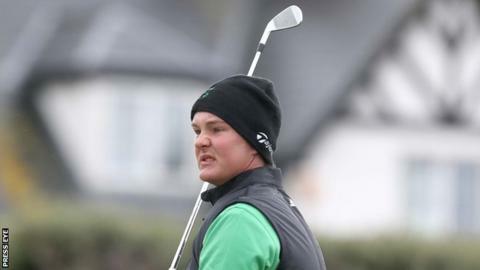 The 21-year-old competed in the Northern Ireland Open last year after winning the Irish Close and Ulster Youths title and finished a creditable 56th after making the 36-hole cut. "I'm especially looking forward to the Northern Ireland Open because I feel my game is in better shape than it was this time last year," added Galbraith. "I'm looking forward to the challenge and playing in front of the home crowd is going to be amazing. "I'm (also) delighted to get picked for the Home Internationals, it was a goal of mine this year. "I wanted to make the team so badly because it's at Portrush," continued Galbraith, who is planning to compete in the European Tour Qualifying School at the end of September. "It's a great event and great to play against these great players in front of home support, then head on to Portrush the following week to represent Ireland," said the 28-year-old from Warrenpoint. Tiarnan McLarnon will be other amateur who will compete at Galgorm after earning his spot thanks to his victory at the North of Ireland Strokeplay title at the Ballymena venue. The three amateurs will be playing alongside the likes of tournament ambassador Michael Hoey. The Challenge Tour event has attracted big crowds to Galgorm in recent years and a host of regular European Tour winners such as Hoey and Johan Edfors have teed up. 2013 Galgorm winner Dutchman Daan Huizing is currently among the entries although the field will not be finalised until after this week's Challenge Tour event in Madeira. Irishmen Damien McGrane and Peter Lawrie, who both have achieved victories on the main European Tour, are also among the current entry list as are Welshman Rhys Davies and 2005 European Open winner at the K Club, Englishman Kenneth Ferrie. Other players like England's Max Orrin and Ireland's Ruaidhri McGee will also be chasing the €27,200 top prize won by Sweden's Joakim Lagergren in 2014. Last year record crowds of over 34,000 came through the gates and similar numbers are anticipated again.